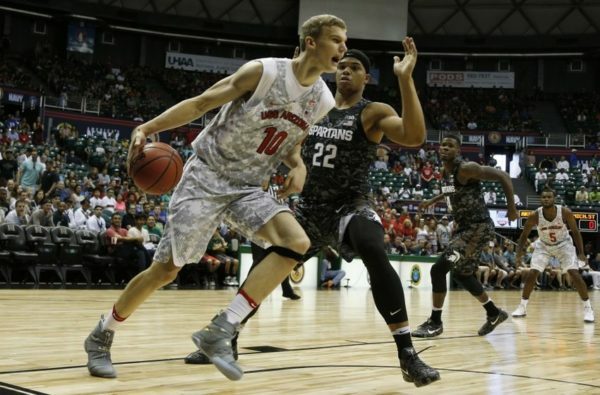 It’s been a few days since the sensational opening-night doubleheader that featured both Michigan State and Indiana, but the attention the Armed Forces Classic in Honolulu brought to the Big Ten deserves further discussion. Unlike most other sports, college basketball rarely opens its season with a number of truly marquee match-ups. Coaches instead typically opt for easy wins against low-majors out of fear of being exposed. This strategy may make sense for individual programs, but it hardly does the sport any favors. This year, however, we were treated to two compelling bouts featuring a quartet of top 15 teams. Each game was action-packed and came down to the wire, as the Spartans lost to Arizona on a last-second layup and the Hoosiers eked out a 103-99 overtime win over Kansas. Kudos should be given to Tom Izzo and Tom Crean for ignoring the “risk” of being exposed early. These coaches instead saw the event as an opportunity to showcase their programs to a captive Friday night national audience, in addition to supporting the brave men and women of the armed forces on Veterans Day. Miles Bridges (#22) may not have been on a winning team, but he was the star of opening night (Fansided photo). In the first game, Michigan State charged to a big early lead before eventually giving up a coast-to-coast layup to lose at the buzzer. While the Spartans missed an opportunity for a nice early resume win, they did get to showcase their celebrated freshmen class. Miles Bridges was especially spectacular, contributing 21 points, seven rebounds and an early candidate for the dunk of the year. In the second game, Indiana outlasted Kansas in a back-and-forth contest that went to overtime. The impressive win against the perennial Big 12 favorite was propelled by a 26-point performance from James Blackmon, Jr., who looked completely healthy after last year’s season-ending surgery. Seven short weeks ago, Indiana was 5-3 with losses to Wake Forest, UNLV and Duke. The Blue Devils had just pounded Indiana 94-74 in the Big Ten-ACC Challenge, scored an absurd 1.52 points per possession while shooting 52 percent from the field, grabbing 19 offensive rebounds and committing just six turnovers. Angry Tom Crean pictures and photoshopped crying Michael Jordan pictures making fun of Indiana quickly became memes. 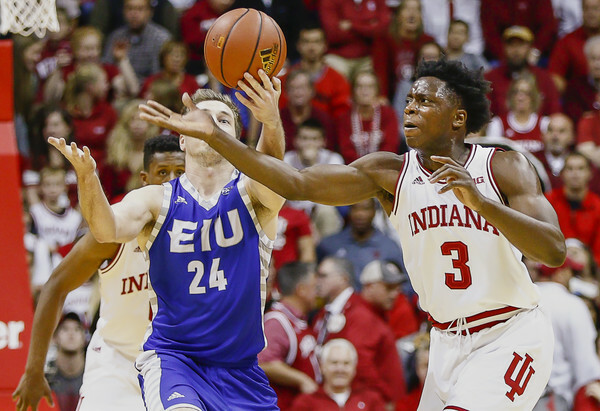 OG Anunoby has become an Indiana fan favorite because of his defense and dunks. (Michael Hickey/Getty Images). Since that loss, Indiana has rattled off 12 straight wins and is one of two unbeaten teams in Big Ten play. The most recent victory was a 32-point romp of Northwestern on Saturday to give Indiana its seventh conference win. The Hoosiers are back in the AP Top 25 and atop the Big Ten. It’s time to believe they might be that good. Former Boilermaker Robbie Hummel is out for the rest of the season after a mid-December labrum tear while playing overseas in Italy. 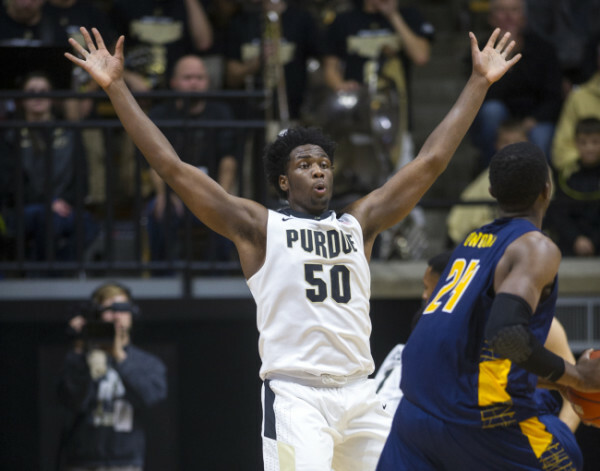 Upon hearing of his injury, Purdue head coach Matt Painter quickly offered his former star player the chance to rehab at his alma mater and help the current Boilermakers squad as an adviser and mentor. He accepted the offer and will travel with the team and hang around the players as much as possible, while also living with Painter and rehabbing. Hummel considers it an internship of sorts to give him a taste of coaching as a post-playing career possibility. Michigan is holding its own without injured guard Caris LeVert, but John Beilein said Wednesday the senior is making “encouraging” progress with his lower left leg injury and is “doing more and more” on and off the court. The on-court work is still only light ball-handling and shooting, but he just recently has been able to walk without pain. Beilein said he still is not sure of a return date. In LeVert’s absence, Zak Irvin has found his shooting touch after a bad start: he has made 15 of his last 32 three-point attempts (47 percent). Rutgers hit a new low Monday, losing to Purdue at home by 50 and furthering the team’s perception as a colossal mess with no improvement in sight. But the school is launching a $100 million athletic facilities project called “R B1G Build,” a move designed to help improve the messy state of Rutgers athletics. The school released a video Wednesday that said athletic director Patrick Hobbs, head basketball coach Eddie Jordan and head football coach Chris Ash will each pledge $50,000 toward the effort. The video came a day after New Jersey governor Chris Christie signed a bill that will allow Rutgers to use $25 million in tax credits toward the project. Nebraska’s surprising 72-71 road win over Michigan State on Wednesday may say more about the reeling Spartans than the Cornhuskers, but it also revealed a Nebraska offense that has improved significantly from last season. Through seven conference games, Nebraska leads the Big Ten in field goal percentage, shooting 49 percent in conference play. Brian Rosenthal of the Lincoln (Neb.) Journal Star writes that the new freedom of movement rules have contributed to the more efficient offense. 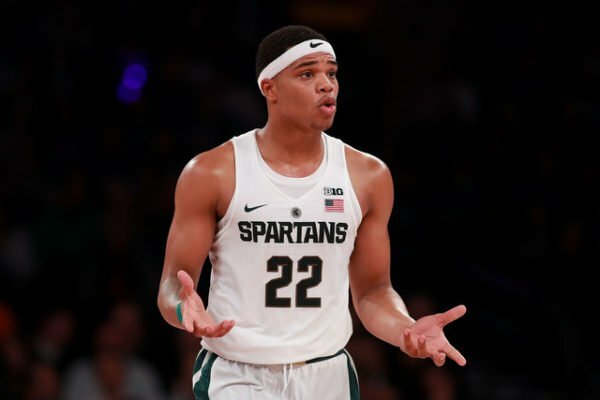 Shavon Shields scored 28 points in Wednesday’s win, but foul-prone Michigan State gave him plenty of space to score, perhaps in fear of fouling too much. Indiana is back in the top 25 and riding an 11-game winning streak, including five in a row to open Big Ten play. The team’s second-leading scorer, James Blackmon Jr., hasn’t played since Dec. 22 and will not play for the rest of the season due to injury. The Hoosiers’ hot streak has caused some fans and media to wonder if Indiana is better without Blackmon. The Indianapolis Star’s Zach Osterman considers the idea ridiculous. Instead, he asks the question, is Indiana better because it had to confront and deal with losing Blackmon? He points to its defensive improvement and determination to play better defense as a big reason why the answer is yes. On Monday, the Big Ten awarded both its Player and Freshman of the Week to the same person for the first time this season: Maryland’s Diamond Stone. The Milwaukee native shot a scorching 73.7 percent from the floor in two games last week, with his coming-out party (39 points and 12 rebounds) occurring last Wednesday in the Terps’ comeback win against Penn State. As Stone continues to improve, so too do the Terps’ Final Four prospects. Indiana received some devastating news hours before its tipoff against Wisconsin last night when it learned that James Blackmon, Jr. — the team’s second-leading scorer — would miss the remainder of the season after surgery on his right knee. The sophomore guard has been out since the start of conference play, and although it has not yet affected the Hoosiers record, Tom Crean’s team will miss his prolific scoring and elite defense. Despite the bad news, Indiana protected its home court and earned a tough 59-58 win over the Badgers to move to 3-0 in conference play. Yogi Ferrell led all players with 19 points as Indiana has now won eight straight games with two of their next three against teams outside of the KenPom top 100 (Illinois and Minnesota). This scheduling gift should allow Indiana some time to recalibrate its rotation now that the Hoosiers know Blackmon won’t be returning. In the late game on Tuesday night, Iowa comfortably beat Nebraska behind Jarrod Uthoff’s 25 points, eight rebounds, and four blocks. The Hawkeyes have put together the most impressive start to conference play at 3-0 with wins over Michigan State and at Purdue. Those performances have garnered Iowa a place back in the Top 25 and strong consideration as a legitimate contender for the Big Ten championship. Iowa will take this coming weekend off before it faces a hungry Michigan State squad that is expecting Denzel Valentine back in the lineup next Thursday. Finally, Indiana and Iowa aren’t the only Big Ten teams riding winning streaks. Ohio State has now won six straight games, including a victory against #9 Kentucky, that puts the Buckeyes at 10-5 on the season. The Buckeyes have played a weaker schedule to date — including conference wins over Illinois and Minnesota — but will be tested in the next couple weeks as four of their next five games are on the road (including trips to Maryland and Purdue). Then we’ll know whether Thad Matta’s team has really turned a corner this season or simply took advantage of a soft schedule to put some wins together. Their first exam will come tonight at Northwestern. Most people rebalance their portfolios at the end of the year, but for some reason Seth Davis decided to file his annual stock report at the start of 2016 (maybe his CPA doesn’t believe in tax-loss harvesting). In any event, it is a good refresher if you haven’t been focused on college basketball with the college football season mercifully ending. We agree with most of Seth’s buy, sell, or hold recommendations although buying the #1 team in this scenario seems akin to buying a stock with a ridiculous P/E ratio. Indiana will be without sophomore guard James Blackmon Jr. for the rest of the season after he underwent season-ending surgery on his right knee yesterday. Blackmon, who was averaging 15.8 points and 4.2 rebounds per game this season (similar to the 15.7 and 5.3 he averaged last year) had surgery on his left knee over the summer and appeared to recover. It is unclear if this injury was related to him overcompensating with the other leg or just a coincidence. In any event, the Hoosiers will have to find a way to make up for the lost offense although as we have seen their problems are usually on the other side of the ball. So far they are off to a good start with their win over Wisconsin last night. One of the bigger stories of this season that has flown under the radar is the success of Southern Methodist as the Mustangs have started the season 13-0, but are banned from participating in the postseason. That ban is in large part due to issues around the recruitment of Keith Frazier, who had been averaging 11.9 points per game, but decided to leave the program because he feels that he is being blamed for the postseason ban. Given Brown’s history it is an amusing twist that the last stop of his coaching career will end with a player leaving him after the recruitment of that player led to the third time that a program run by Brown has been sanctioned by the NCAA. Speaking of sanctions, it appears that San Diego State will not face any from the NCAA for allegations that they provided recruits with improper benefits. According to the original reports these could have potentially resulted in Level 1 violations. The full extent of the reported violations never came out publicly (possibly because there wasn’t enough evidence to substantiate them), but given Steve Fischer’s history of being fired at Michigan in the wake of the Ed Martin scandal we can understand if San Diego State fans and the administration are feeling a sense of relief. It might seem early to be talking about impact transfers, but Louisville appears to have landed one for next season in Penn guard Tony Hicks, who led the Quakers in scoring the past two seasons. Hicks is sitting out this season and will graduate in May making him eligible to play next season for Louisville as a graduate transfer. We aren’t ready to start thinking of Louisville as another version of Iowa State, but Hicks will be the third significant transfer to Louisville in the past two seasons with Damion Lee (17.6 points and 4 rebounds per game) and Trey Lewis (14.3 points and 2.4 assists per game) leading them this year.